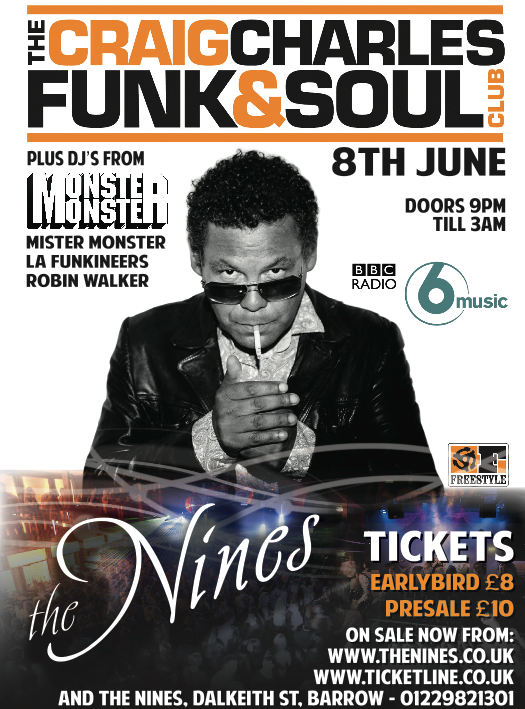 BBC 6 Music Funk & Soul Show DJ Craig Charles has packed up his ‘Trunk of Funk’ and is heading to The Nines Barrow, playing the planets funkiest tunes. Famed actor and presenter Craig Charles join us on stage for a night overflowing with Northern Soul Stompers, rare Disco treats, R&B shakers and heavy Funk for all those looking to get down on the dance floor. Having been broadcasting live every Saturday night on the BBC 6 Music for over 10 years, Craig Charles has garnered global support and recognition as one of the UK’s foremost Funk and Soul commentators and promoters of new music, whilst still championing classic golden age Funk artists of the 60s and 70s. who will all be tearing off the roof ‘til 3am. This entry was posted in activities, event, Events, holidays, Lake District, latest, News, south lake district, south lakes and tagged Arts, Craig Charles, Disc jockey, dj craig, entertainment, Funk, Kendal, Kendal Calling, monster monster, Music, Northern soul on May 30, 2013 by cottageholidaygroup. TV presenter Helen Skelton, of Blue Peter fame, has become one of the first people to experience an innovative new cycling initiative in the the Lake District. The event was the first in a series of 30 free guided group bike rides led by British Cycling trained Ride Leaders planned for the Lake District this summer. 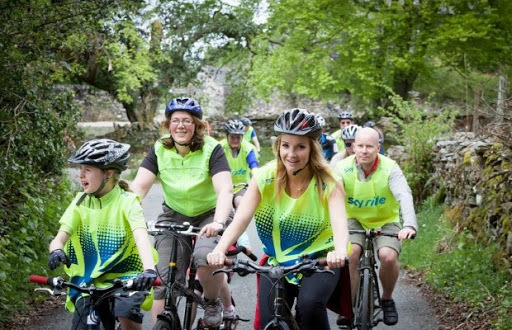 Aimed at all age groups and experience levels, the Sky Ride Local rides encourage people to experience the Lake District in a healthier, greener way. It is the first time Sky Ride Local has come to a National Park, and the GoLakes Travel programme has teamed up with British Cycling to bring the initiative to the region. Between now and the end of September, Sky Ride Local rides will also take place around scenic spots such as Hawkshead, Coniston Bowness, Elterwater and Ambleside. Starting points for the routes will also make the most of traffic-free cycle routes being enhanced through the GoLakes Travel programme, with many getting underway close to bike hire points. For some routes, there is even the option of hiring an electric bike. Helen Skelton said: “I’m delighted to be one of the first to experience this new cycling initiative in what is probably one of the most perfect locations in the country to cycle. I love to leave the car at home and get out on my bike. Cycling is such an important sport for all ages to get involved in and this ride will bring cycling fans together from all different backgrounds and abilities to enjoy riding in such a stunning landscape”. This entry was posted in activities, Ambleside, Bike Bus, cottage holiday group, cycling, event, Events, holidays, Lake District, Lake District Cottages, News, self catering holidays and tagged Ambleside, Blue Peter, British Cycling, Cumbria, Elterwater, Hawkshead, Helen Skelton, lake district on May 23, 2013 by cottageholidaygroup. HONISTER Pass was today chosen as the iconic setting to unveil the Tour of Britain’s first visit to the heart of the Lake District. Organisers gathered on the 356m-high route to reveal the path which 100 of the world’s top cyclists will tackle during stage two of the race. The pass, which features gradients of up to 25 per cent, will provide competitors with their sternest test yet as they head from Carlisle to Kendal on Monday, September 16. Setting off from the city centre at 11am, racers will snake down the county via Wigton, followed by a Yodel Sprint starting from outside St Kentigerns Church in Aspatria. Moving next onto Cockermouth, another Yodel Sprint will follow at Dearham, near Maryport, before a third starting outside Whitehaven School. They will then take on SKODA King of the Mountains climbs at Mockerkin, near Cockermouth, and Chestnut Hill, Keswick, in what is billed as one of the toughest stages of the entire 2013 tour. After passing through Grasmere, Ambleside, Windermere and Crook, riders on the 186.6km route will have to summon the strength to climb Beast Banks, Kendal, which featured in the 2007 race. Competitors face more than 3,000 metres of climbing during the stage with the first racers expected to cross the line at around 3.13pm. North West professionals Matt Cronshaw, of Team IG Sigma Sport, and British Hill Climb Champion Jack Pullar, of Madison Genesis, joined Tour of Britain organisers and officials from across Cumbria to reveal details of the route. The tour is returning to Cumbria after last year’s stage start in Carlisle, which attracted thousands of spectators. It is estimated the event will generate up to £4 million for Cumbria’s economy. David Southward, Cumbria County Council’s cabinet member for economic development, said: “The Cumbrian stage will be a high point – in all senses – of this year’s tour. “The excitement is building and Cumbrian schools and communities are already showing a great deal of interest. Lake District National Park Authority chief executive Richard Leafe said: “Hosting the most challenging mountain stage of the Tour of Britain in one of the UK’s most dramatic landscapes will provide a fantastic opportunity to position the Lake District as an exciting and awe inspiring place. And Richard Greenwood, Cumbria Tourism’s head of policy and research, added: “Hosting a full leg of the Tour Of Britain in Cumbria provides us with an excellent opportunity to showcase our beautiful county – the UK’s Adventure Capital – both within the UK and internationally. “As a cycling destination Cumbria has so much to offer, with country lanes, quiet back roads and lots of National Cycle Network routes to explore, as well as more challenging off road routes over high fells and mountains. Stage Two of the race is being organised in partnership with the Lake District National Park Authority, Cumbria County Council, Carlisle City Council, South Lakeland District Council and Cumbria Tourism. The Tour of Britain, the UK’s biggest professional cycle race and largest free-to-watch sporting event, starts in Peebles in the Scottish Borders on September 15. Attracting Olympic, World Champion and Tour de France stage winners, it runs until September 22. This entry was posted in activities, Bike Bus, cottage holiday group, Cumbria, cycling, event, Events, grasmere lake district, Lake District, News, tour of Britain and tagged Britain, Cumbria, Cumbria County Council, Keswick, lake district, Mockerkin, Team IG Sigma Sport, Windermere on May 23, 2013 by cottageholidaygroup. 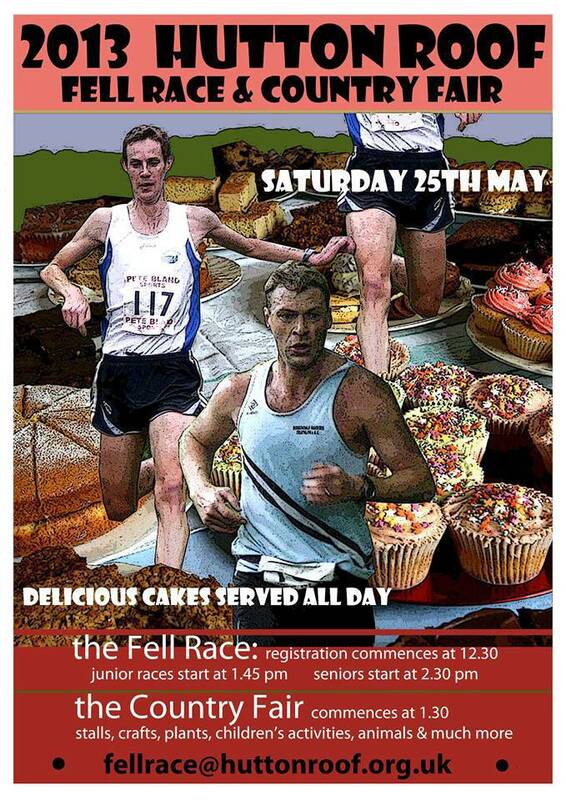 This entry was posted in activities, bookings, Competition, cottage holiday group, Cottages, Cumbria, event, Events, holidays, keswick, keswick Lake District, Lake District, Lake District Cottages, News, self catering and tagged Auto Racing, Equestrian, Fell running, Motorsports, Peak District, Racing, Saturday, sport on May 22, 2013 by cottageholidaygroup. A Free Fun Filled Day- Join Us! 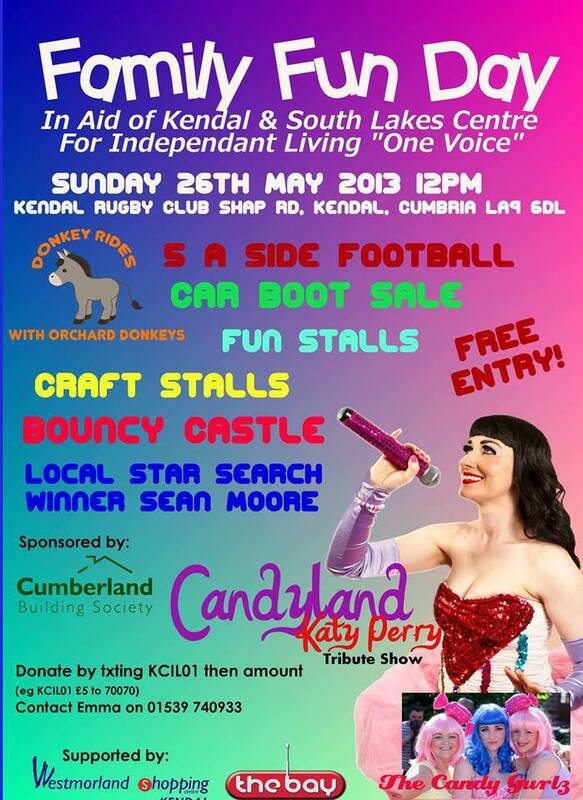 A fun filled free day in aid of Kendal and South Lakes Centre for Independent Living “One Voice ” a Local Disability Charity based in Kendal. Highlights of the day include Kerri Leigh as Katy Perry, Local Star Search winner Sean Moore, there are plenty of inflatables for young and old, car boot sales, fun stalls, craft stalls and food stalls, an emergency vehicle stand and many many more activities for the whole family. If you would like a stall for arts, crafts, for fun or a car boot please let me know in advance. If any one could also put posters up for me in your place of work, would you also let me know. This entry was posted in Contact, cottage holiday group, Cottages, Cumbria, event, Events, Lake District, Lake District Cottages, latest, News, self catering, self catering holidays, south lake district, south lakes, Travel and tagged Bedfordshire, Car boot sale, Claire Anderson, Independent living, Katy Perry, Kendal, Old Bailey, Sean Moore on May 22, 2013 by cottageholidaygroup. 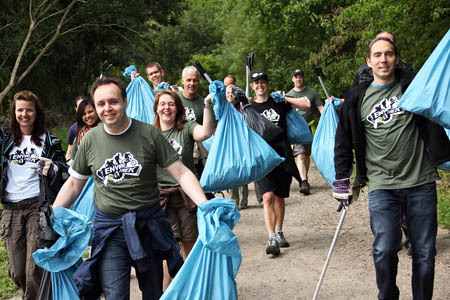 Outdoor enthusiasts are being offered the chance to clean up the environment and join in action pursuits for a second year. The Respect the Mountains Envirotrek Mountain Clean-Up sponsored by outdoor brand Keen, will this year take place at two venues. A June clean-up in the Peak District will be followed a week later in the Lake District. Participants will join in the clean-up in the morning and then will be provided with lunch before enjoying their choice of outdoor activities. The Peak District event will be based at Castleton and the Lakeland one at Keswick. A Keen spokesperson said: “Group leaders are allocated and all participants will be provided with cleaning and safety equipment and fully briefed with a safety talk. “The clean-up finishes at around 12.30pm, with volunteers being rewarded for their mornings’ efforts with a hearty lunch – soup and bread in Lake District, a barbecue in the Peak – on the hillside. “Participants get to spend the remainder of the afternoon enjoying a range of fun outdoor pursuits organised by the Envirotrek leaders. In the Peak District this will include caving, climbing, rope activities and a ridge walk, whilst the Keswick event will feature climbing, canoeing and gill scrambling. The English gatherings are part of a series of mountain clean-up events held across various European mountain destinations since 2009 including Germany, the Netherlands, Austria and France. The Keen spokesperson said: “With an estimated 16 million visitors to the Lakes and an incredible 22 million scheduled to visit the Peak District this year alone, the environmental footprint is considerable and so popular mountain destinations are becoming increasingly in need of on-the-ground action to clear them of waste in order to maintain their natural beauty and enjoyment for generations to come. “Envirotrek helps to address this need, drawing together tourists, local communities and businesses to give something back to their environment while enjoying some playtime in the great outdoors. Anyone interested in taking part should register online at the Respect the Mountains or Keen websites. The clean-ups will take place on 16 and 23 June. An entrance fee of £9 is payable locally on the day. Children with a responsible adult are welcome; the fee for ages up to 12 is £4.50. Keen said if you bought a pair of Keen footwear since August 2012 registration is free. More details are on the two websites. This entry was posted in activities, Castleton, clean-ups, climbing, Cottages, event, keswick, keswick Lake District, News, Peak District, scrambling, Travel and tagged France, Germany, John McHale, Keswick, Lake, lake district, Outdoor recreation, Peak District on May 18, 2013 by cottageholidaygroup. Chance for dads to enjoy the limelight with a day dedicated to showering them with gifts, cards and grand gestures or taking them for a memorable day out. A DAILY VISUAL TRAVEL / your daily inspiration.